As tablets go, the specs for the Flyer (I like this name better, so I'm sticking with it) are impressive but far from unique: a 7-inch, 1024-by-600 display; 1.5GHz Qualcomm Snapdragon processor; 1GB of RAM; 32GB of internal memory; a microSD card slot; and dual cameras (5-megapixel rear, 1.3-megapixel front). Nice, yes, but not unique enough to win a specs battle against the iPad 2 and umpteen other Android tablets that will ship this year. What makes the Flyer unique is its pen-input feature. OK, I know what you're saying. A stylus? Pen input? That's so ten years ago. Didn't Microsoft and others try and fail at pen-based tablets sometime last century? In the consumer market, tablets never caught on until Apple launched the iPad in 2010. And as we all know, the finger-friendly iPad most definitely does not require a stylus. "Don't worry, you don't need [a stylus] to operate the device. The pen is used mainly in the Notes app: you can draw out ideas whiteboard style-and talk while you're doing it-and the app records everything that happens," he wrote. If one can trust HTC's promo video, the Flyer's pen implementation looks pretty slick. The abilities to notate in ebooks, comment on documents and Web pages, and sign contracts with a stylus add a new layer of functionality to today's tablets. A pen is also better for many drawing and photo-editing tasks, as the video carefully illustrates. As much as I like the touch-based iPad--and to a lesser degree, the Samsung Galaxy Tab--I've felt that some tools would benefit from a more precise input device (e.g., a stylus). 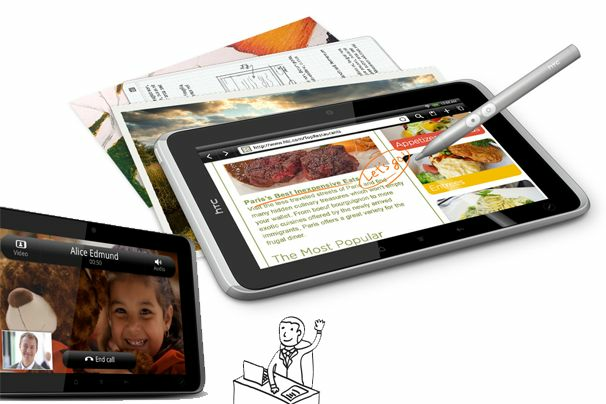 It'll be interesting to see if HTC's pen-input makes the Flyer a standout in an increasingly crowded tablet market.